As a start-up company in the garage, Amazon Supply Chain has made a giant leap that revolutionized many aspects of overall supply chain management. With more than 130 million stocking keeping units to manage and millions of transactions to control, this article will show you how they make it. We've previously covered supply chain issues of the world's leading companies including Amazon in the article "Supply Chain Case Study". Anyway, we feel there are something missing. At Amazon, they care so much about customers and this is not just something fancy to say. In many internal meetings, Bezos leaves one empty chair next to him and tell people that they should also think on behalf of one important customer who can't manage to be there. Then the word "empty chair" becomes a symbol of customer-centric business practices inside Amazon supply chain. Also, many executives have to attend call center training so they can know customer's feedback, good or bad, firsthand. Many companies focus on benchmarking performance against competitors but this is not the case for Amazon supply chain. Bezos believes that the pace of industry change is too fast so it's not good to make a knee-jerk reaction after competitors do something new. 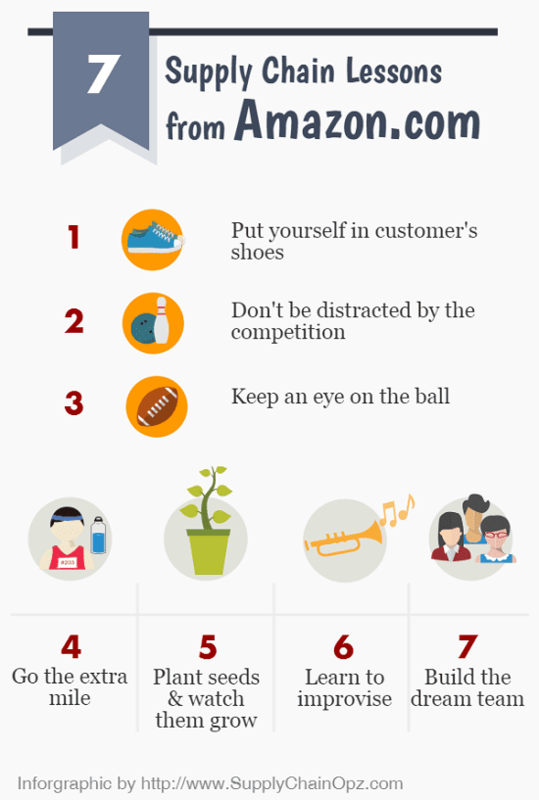 What Amazon does is to acknowledge what happens but keep focusing on its customer's needs. The culture of Metrics is the word used to describe the obsession over the performance measurement. They're currently tracking about 500 KPIs and 80% of them are customer related. Bezos once insisted on using the better quality box so the customer can reuse it. And when Amazon's brand is on every box, it's the free publicity. He also pushed many executives at DCs to extend order closing time to 6pm or 7pm, even though this means the over-time cost to Amazon supply chain. The example of this philosophy is that Amazon invests in many hardware technologies that don't make any short-term gain just to make sure that they build Kindle that people love. Amazon asks candidates to make action plans, outside their comfort zone, with the assumption that there will be no budget for such a plan, to test how each candidate react to unfamiliar business issues. As mentioned earlier, the pace of industry change is fast so they need people who can think outside the box. Amazon believes small work team is more efficient. To determine the right size of each team, they've developed a "rule of thumb". If it needs more than 2 pizzas to feed the team, that team is too big (so I name it "2-Pizza Heuristics"). I'm really a big fan of simple principles that work. In a very complex world, Amazon supply chain uses customer's needs as its guiding light. Do you feel these are things that you can apply to your situation? Do you think, if you focus on the customer, things will never go wrong? - Stone, B. (2013). The everything store: Jeff Bezos and the age of Amazon. Random House. - Hansen, M. T., Ibarra, H., & Peyer, U. (2010). The best-performing CEOs in the world. Harvard Business Review, 88(1). - Bezos, J., Kirby, J., & Stewart, T. A. (2007). The institutional yes.